Don’t expect Ni no Kuni II to just be a new rehash of the first game though. Revenant Kingdom promises to expand and improve, with some familiar mechanics going away and new ones coming in to take their place. 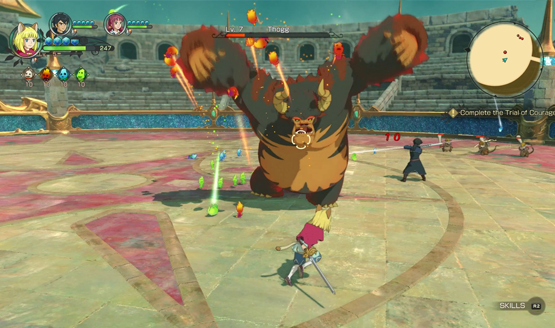 Ni no Kuni II seems to be embracing a more action RPG approach as the familiars from the first game are nowhere to be seen. Instead of relying on these creatures to fight, the main characters themselves do most of the fighting, aided by a bunch of small sprites called higgledies that will occasionally do things to alter the battle like buffing your characters or weakening the enemy. The battle I played was against a massive dragon on a small island in the middle of a sea of lava, so I don’t know how indicative of the moment to moment battles against more traditional enemies that demo actually was. While I’ll miss traveling the world and collecting a cast of interesting creatures to be my fighting force, I’m glad that they are at least trying to explore something new, and I’ll reserve judgment until the final game releases. Perhaps it’s for the best. Maybe the world has moved on from familiars. Maybe it’s a surprise yet to be revealed. Or maybe they just want to make a game that’s different enough from the first to hold its own identity, giving both games a reason to coexist. Higgledy heroes were teased but not detailed, so these might be what replaces the familiars we are used to. One major part of the game will be bonds that Evan, the main character, creates with the rest of the cast. Again, this is something that was very briefly touched on but not detailed, so I’m not sure what impact this will have on the wider gameplay. The primary bond that was shown is that with the character Lofty, who essentially takes on the kind of advisory role that Mr. Drippy played in the first game. He wants to help Evan reclaim his place as leader of a kingdom, which brings the final tease we were shown. Ni no Kuni II’s kingdom mode will allow you to build and customize your kingdom, recruiting characters and townspeople to acquire resources and make your kingdom your own. It’s unclear how in depth this kingdom mode will go, but in some ways just hearing about it reminds me of Dark Cloud and collecting bits and pieces to build the towns. Given that this mode is all new to Revenant Kingdom, it will be very interesting to see how they apply it to the Ni no Kuni gameplay. I can’t wait for more Ni no Kuni. Even if we weren’t to see any more details until release, Ni no Kuni II is looking like a day one purchase for me. With so many hidden details that we’re sure to hear more about over the coming months, I can only get so excited before needing to get my hands on another Ghibli-styled grand adventure. 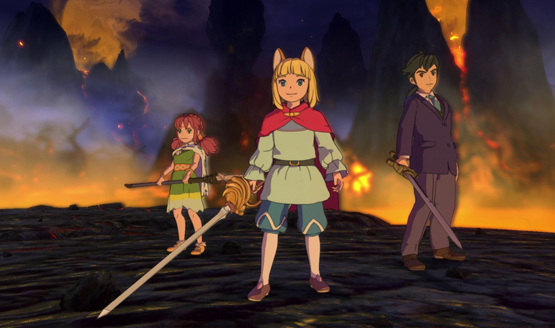 Ni no Kuni 2: Revenant Kingdom releases on PS4 and PC on November 10th, 2017. Check out all of our E3 2017 coverage.